I cobbled together this recipe from Alice Medrich's Olive Oil and Sherry Pound Cake (in Pure Dessert) and what I remembered of the ravani, a traditional Greek cake made from semolina, olive oil, almonds, oranges, and syrup, served at Seattle's Vios restaurants. 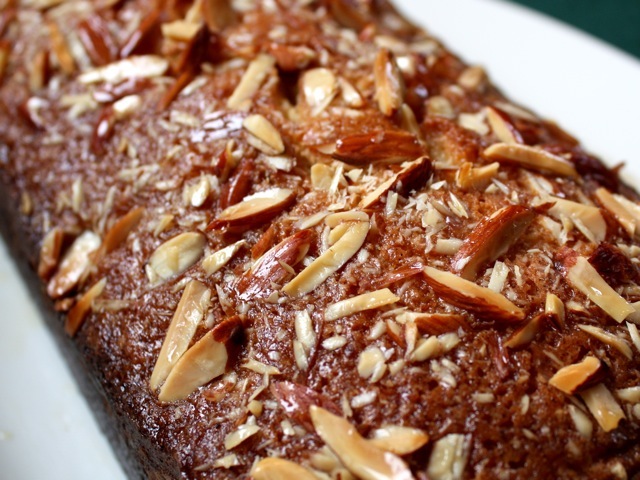 It's basically a light, moist, nut-topped pound cake, redolent with the Mediterranean flavors of citrus and almonds. Place a rack in the lower third of the oven and preheat the oven to 350 degrees. Line the bottom and sides of a loaf pan with parchment paper, making sure to leave a bit of paper hanging over the edges. Sift together the flours, baking powder, and salt. Sift a second time, then set the mixture aside. In the bowl of a stand mixer (with the whisk attachment if you have one), beat the sugar, oil, and orange zest on high speed until well blended. Add the eggs one at a time, beating well after each addition. Beat until the mixture is thick and pale, about 3 to 5 minutes. Stop the mixer and add a third of the flour mixture, then beat until just incorporated. Stop and add half of the sherry, then beat until just incorporated. Repeat with the second third of the flour, then the other half of the sherry, and then the final third of the flour. Scrape the batter into the prepared pan. Scatter the slivered almonds across the top of the batter. Bake until a toothpick inserted into the cake comes out clean, 50 to 60 minutes. Cool the cake in the pan on a rack for 15 minutes. While the cake is cooling, make the optional syrup by simmering together the sugar and the orange juice over medium-low heat until the sugar dissolves and the syrup thickens. Let cool for another 15 to 20 minutes to serve warm, or cool completely before serving. Wrap any leftovers for storage.